Offering you a complete choice of products which include suction line hermetic filter driers, ek series liquid line filter driers, emerson filter drier and asf series suction line filter driers. We are offeringSuction Line Hermetic Filter Driersto our client. 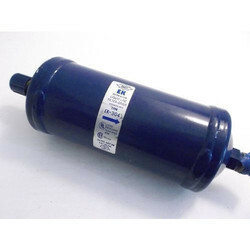 The EK liquid line filter drier is a premium compacted bead filter drier that is buffered by an initial 40-micron fibre-glass filter to remove most of the solid contaminants and sludge and a 20-micron final filter to remove any remaining contamination. 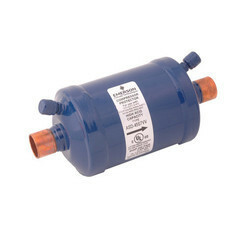 This ensures that the refrigeration system will stay cleaner longer with minimal pressure drop in the filter drier. The R-410A optimized EKZ filter drier features 100% molecular sieve desiccant for high water capacities. Other filter driers in the EK family include the Contractor's Choice EK filter drier that features extended connections for easy installation and access valves for easy diagnosis. Furthermore, the EK Cap filter drier is optimized for foodservice refrigeration systems featuring capillary tubes. Emerson also offers a complete line of solid core liquid line filter driers such as the ADK and the bi-directional BFK for heat pump applications. 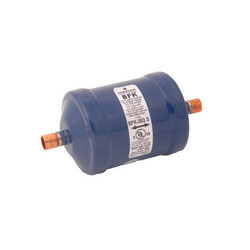 The R-410A optimized BFKZ solid core filter drier features 100% molecular sieve desiccant for high water capacities. Other Emerson liquid line filter driers include the BOK-HH for burnout clean-up and wax removal, the ALF for recovery, recycle and reclaim usage and the high capacity spun copper solid core CU series filter drier for superior corrosion resistance in ocean going vessels and coastal applications. Filter driers remove moisture and contaminants to keep the system running reliably and efficiently. 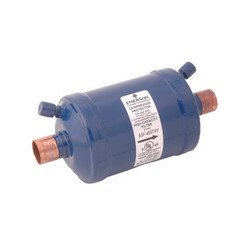 It provides reliable and longer lasting protection by shielding compressors and controls from chemical impurities and debris and keeping the system clean and running at peak efficiency for a trouble-free operation. Corrosion resistant epoxy powder paint finish. Looking for Filter and Driers ?